You got some genre on ya. The other day I was finishing up my mix for this month’s song over at DuelingMixes.com. When I got done, I pulled up Graham’s mix and listened to it. Graham’s mix sounded awesome as usual. And as I listened, I was struck by how different our mixes sound…not because one mix is obviously better than the other. No, ’tis deeper than that. It had to do with our STYLE of mixing. See, the song is a HUGE song, lots and lots of guitars, vocals, drums, etc. And you could take it in one of several different directions stylistically. This song was a bit different. It could easily “fit” into two different genres. What’s fun is that Graham took it one direction, and I took it the other. The takeaway point here is this. When you’re starting a mix, early on in the process you should decide HOW you’re going to mix the song. This single decision will affect every other decision you make during the mix. One direction might call for a big, roomy drum sound with a smaller kick drum sound. The other might call for a very dry drum sound, with a huge kick drum sound. It’s up to you to figure out what direction you want to go. It takes a bit of practice to get good at this. 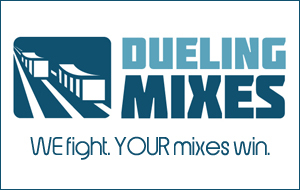 That’s where Dueling Mixes comes in. You get a new song each month to download, drag into your software, and start mixing. You get to decide how you want to mix it, AND you get to peak over Graham’s and my shoulders and see how WE went about mixing. And brand new tracks are available TODAY.